Currently Repetier only reports the "active" extruder temp in a live fashion. Marlin appears to send all extruder temps every time, can T0 and T1 be updated regardless of which extruder is active? I just realized this is probably a bug. When the printer is first started both temperatures show appropriately, but after switching between Extruders the temperatures shown don't react as expected. OK, so i'm not longer sure if this is a feature request or bug report? If I change selected extruders in Repetier without setting the temperature for the newly selected extruder, it reads the previously set extruder temperature. Would always using the T0 and T1 temperatures vs the 'current' extruder temperature solve this without firmware changes? I'm not sure if this is a pervasive marlin issue or just a problem on my particular version of marlin. Lastly, there is quite a delay when selecting the radio button for a new extruder, and the radio button 'hopps' back and forth which is a little confusing. In deed looks not correct. Normally marlin also reports the output with @0 @1 and we in deed prefer T0/T1 over T so this should not happen. Have to investigate if the missing @ is causing the problem here. I assume you are using altest 0.90.6 version? but I could not reproduce the problem. Since we recently changed parsing I will wait for you to confirm you are running 0.90.6 - if not please update and report if it helped. I found where the @ was commented out in my marlin firmware and have tested it with the added info enabled. Still the same result. Please let me know if there is anything I can try or infor I can provide to help. Your support has been excellent. Ok, I could replay the error now after replaying your video. The problem is mainly that your Marlin firmware is reporting wrong temperatures for the active extruder after switching to T1. The T: comes last and overwrites T0/T1 result in server (have disabled this if T0: is included for next update). Anyhow if you go to 0:30 in your video you see firmware reports change of extruder but still reports temperatures from T0 as T: so that gets then into the second extruder values. 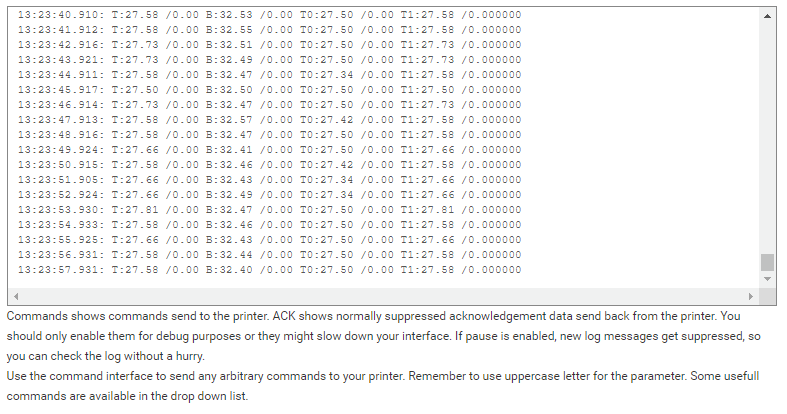 So the main reason is a bug in your firmware which I fix on server side, but better is to report correctly. Thank you, I'll see if I can track this down on the marlin front as well.